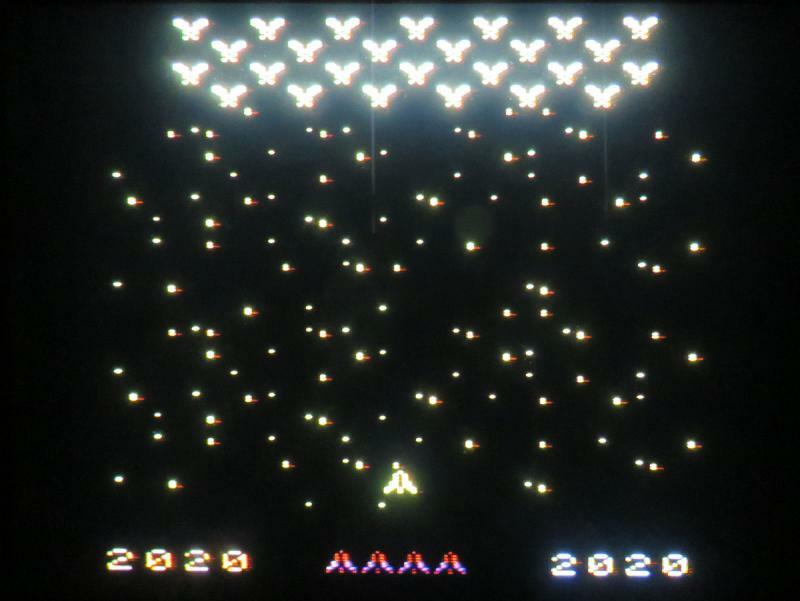 Season 2, Round 1 of the Arcadia 2001/MPT-03 High Score Club will last about two weeks. This round ends on Sunday, January 21, 2017 at 10pm MST (aka Monday, 2am GMT). 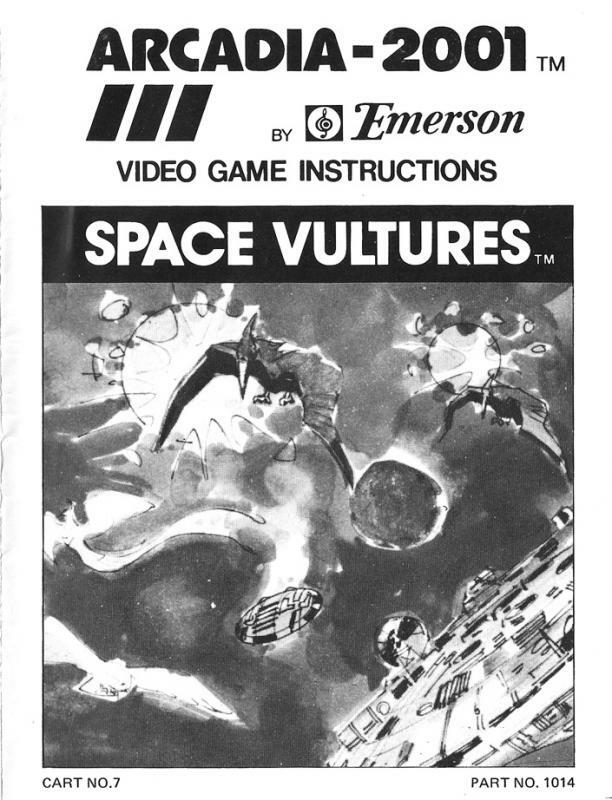 The game being played this round is Space Vultures, a game released in 1982 for the Emerson Arcadia 2001. Space Vultures is based on Taito's 1980 space-themed arcade game Phoenix (released in America by Centuri). As is the case with nearly all Arcadia artwork, there is a weirdness going on here that is just about inexpressible. In this case, it appears as though there is a pterodactyl versus (yet another) Millennium Falcon-like spaceship. Ah, Arcadia Artist-- where are you? I want to know the story behind these box covers! Play Space Vultures on real hardware (PAL, NTSC, and any Arcadia family systems) or use the WinArcadia or MAME emulator. The only gameplay option for Space Vultures is being able to choose which is the first screen you play first. Choose to play the first screen by pressing start just once. Shoot all the small hawks on the first screen and all the mother hawks on the second screen. We're playing for highest score. Post pictures of your high scores here. Confirmed. 6k cart. 1982. #1014 (7). Unauthorized clone of "Phoenix" coin-op. One player; left side controller. Long cart. See the non-U.S. section for notes on the missing mothership stage. Confirmed. 6k. #MC1013 (7). Long cartridge. Unauthorized clone of the "Phoenix" coin-op arcade game. Missing the arcade game's "mothership" stage for legal reasons. Circumstantial evidence strongly suggests there is a version of the game somewhere that includes the missing boss level. In June of 1982 Hanimex told the U.K.-based magazine "Computer and Video Games" that they planned to have a copy of "Phoenix" ready for the initial launch of this system. LANDMARK: Atari's initial survival plans in 1982 centered on protecting their exclusive rights to "Pac-Man". This forced consumers to buy their inferior version of the game, even though many better versions did exist at the time. ("If you can't beat them, have them disqualified"?) Atari spent much of 1982 setting legal precedents regarding "Pac-Man". Many competitors were already reeling from unexpectedly slow (or no) sales during the Christmas 1982 season. Atari tried to finish them off by buying up more arcade game rights, and barring any of their competitors from being able to make good clone games. 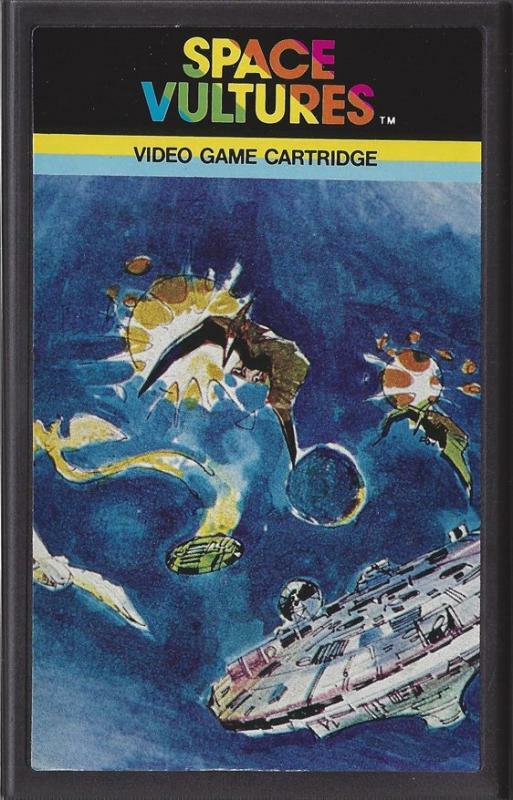 One of the second-wave of licensed games was "Phoenix". A number of companies wanted to make a home version, but once Atari bought legal copyrights, they KNEW they would be sued if they put out an infringing version of the game. 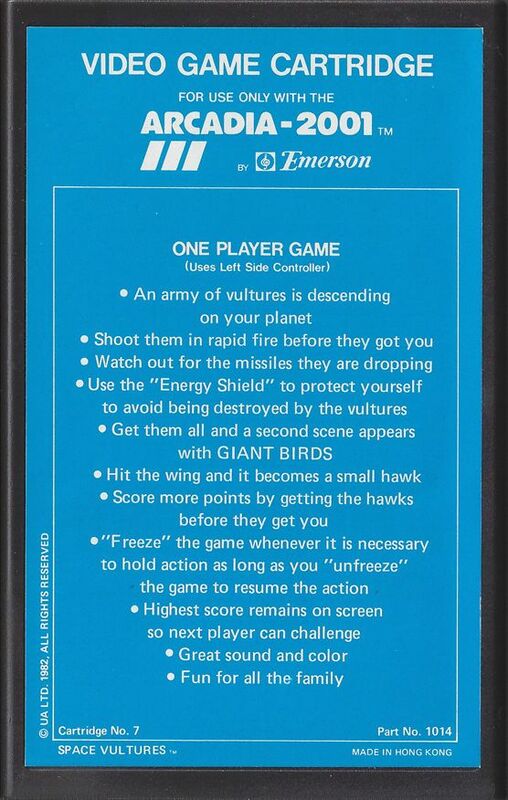 Imagic tried it anyway with their "Demon Attack" game for the Intellivision. 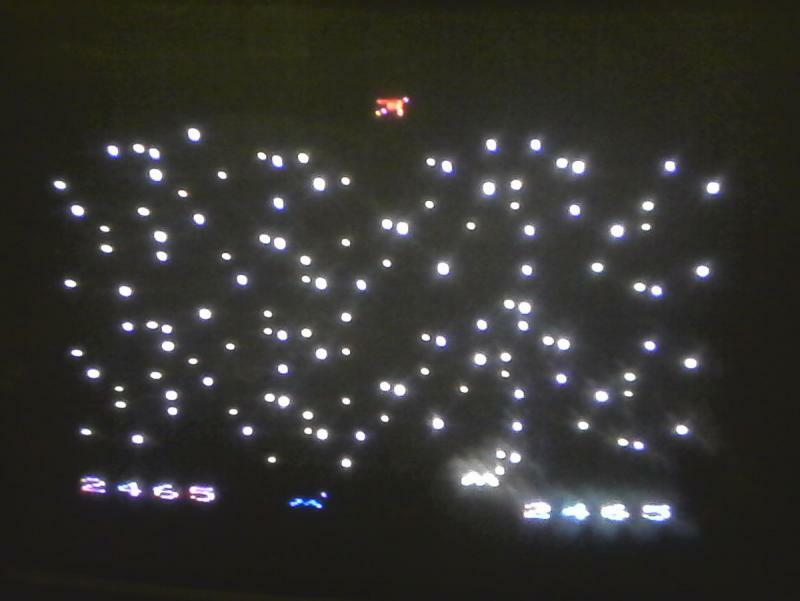 Atari sued them, citing the boss stage as the reason. 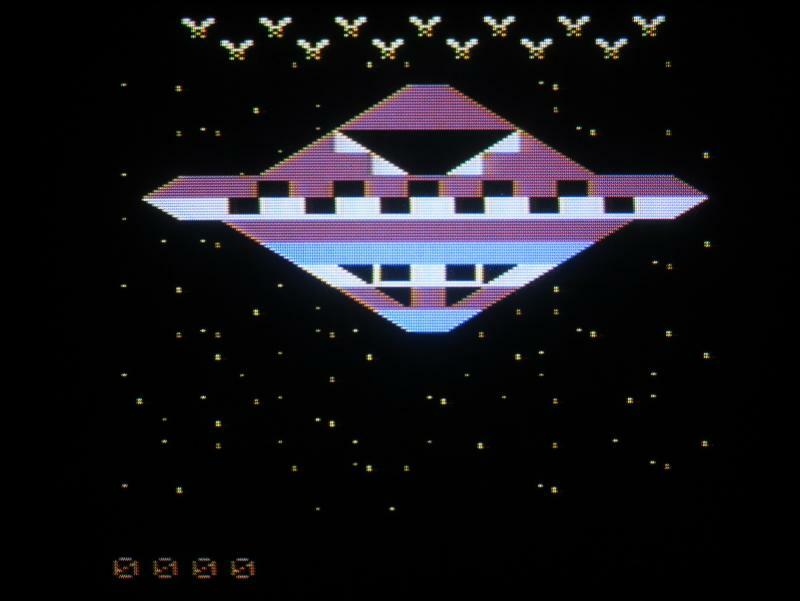 Other "birds in space" games were implied to be OK, since Atari did not go after games that did not have a mothership stage. Hence the removal of this stage by the makers of this console and its games. I say "removal" since it is clear that there were no technical reasons the level could not be included. "Red Clash" has a mothership stage in it; it may even be re-used raw assembly code from "Space Vultures". SV only used 6k of code, with 2k still available. This doesn't sound like much at first, but consider that "Crazy Gobbler" fit into less space than 2k. The game "Hobo" had 5 different screens and "Jumpbug" had 12 screens, and neither of those games used more than 8k of space. 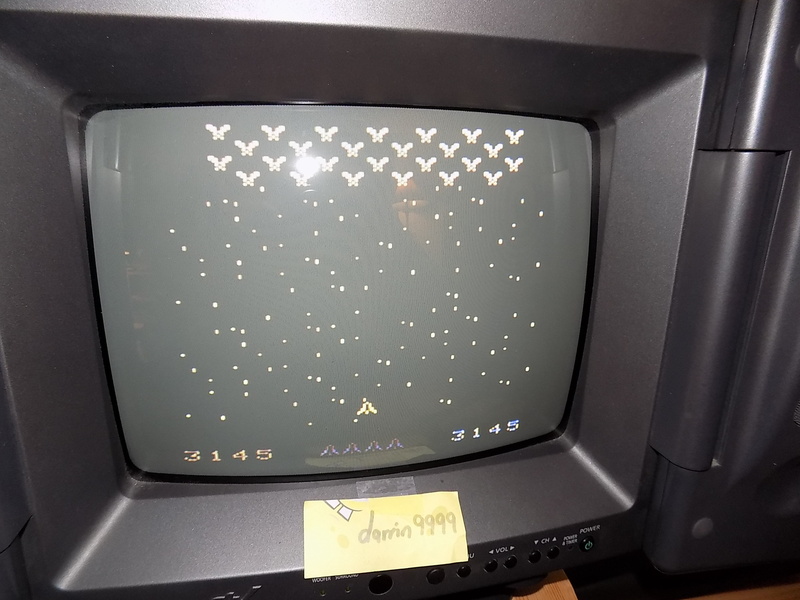 German collector Stefan Piasecki collected for the TVG console back in the day, and he reports hearing the rumor even then that the game included the mothership stage. He suspects magazine reports or internal literature had described an earlier version of the game (made before Atari bought the arcade game's rights), which is why shop owners told him that the stage was there. If you look at the Emerson console's box art, you will see it implies the inclusion of a mothership stage. The use of EPROMs instead of ROMs in the USA is suspicious in itself; it implies a last-minute game code change. The recent confirmation that these games were all written in assembly language, likely shoots down the idea that the missing boss stage is merely hidden inside the existing code, simply lying dormant and unused. (See also "American Football".) Last but not least… an MPT-03 catalog for the Prestige company appears to show a screenshot of the boss stage of this game. Olivier Boisseau correctly states that this may have simply been a faked screenshot, with nothing to back it up. But it also is just as possible that it is an accurate rendering of a game that once existed and was nearly ready for its final release. With so many other arcade clones showing up in two different versions -- an early one that was a blatant arcade clone and a later one that was a post-lawsuit, "watered down," legalized version of the first game -- it stands to reason that this game likely suffered a similar fate. The point to all this is simple… Ward wants people to keep their eyes open, so we can find and archive the full ROM version. Unconfirmed. #MG-322. AKA: "Space Vultures". 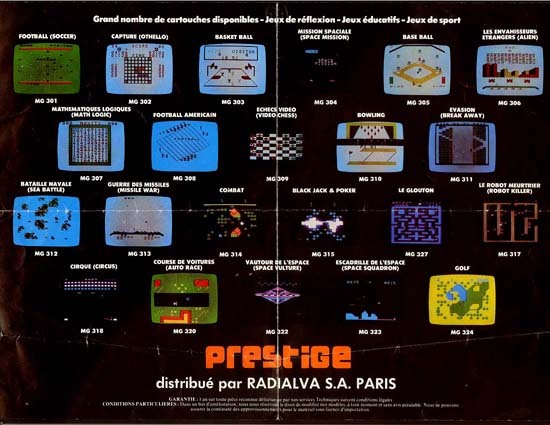 A catalog by Prestige shows a screenshot of the last stage -- the mothership -- of the arcade game. See "Space Vultures" notes. Watch out!! VULTURES from space are attacking your ROCKET. At start, either one of scenes, SMALL HAWKS or MOTHER HAWKS, can be chosen. Avoid the dropping bombs from the enemy VULTURES and their collidings. Fire your ROCKET to destroy them. An energy shield is provided to your ROCKET only in the combat with the SMALL HAWKS. When your ROCKET is energized, the firing from the SMALL HAWKS and their colliding cannot destroy your ROCKET. Five consecutive ROCKETS are provided to you for each game. The purpose of the game is to score as many points as possible by hitting the VULTURES. There are 2 different scenes of play that can be selected, SMALL HAWKS by pressing "START" button once or MOTHER HAWKS by pressing "START" button consecutively twice. However a second scene with 3 MOTHER VULTURES (See Fig. 4) will appear after all SMALL HAWKS in first scene have been destroyed. Fire your ROCKET by depressing any "FIRE" key on keyboard or squeezing any Action Switch located at the side of the hand controller (See Fig. 1A and Fig. 2) to destroy the VULTURES. To avoid the deadly bomb and collision, move your ROCKET left/right and up/down using the control of the disc/joystick on hand controller. In the combat with MOTHER VULTURES, you can control your ROCKET to move left/right only. If your firing hits the MOTHER HAWK'S wing or wing tip, the wing or wing tip becomes a SMALL HAWK which cannot be destroyed and do not attack you. But they will come back to attack you and can be destroyed in another scene after all MOTHER HAWKS have been killed. You have to hit the MOTHER HAWK'S body or another wing again, otherwise it is still alive and continues to attack you. While the combat with the SMALL HAWK, your ROCKET can be energized to protect itself being destroyed. Simply depress any "ENERGY SHIELD" button on keyboard. The color of your ROCKET will change to blue for a few seconds. A next energy shield can be set up after a short interval. The time of interval increases as your scoring point increases. Your firing or collision can destroy the enemy HAWKS but the collision does not increase the score. To maintain highest score on the screen, merely press "START" button for the next game. 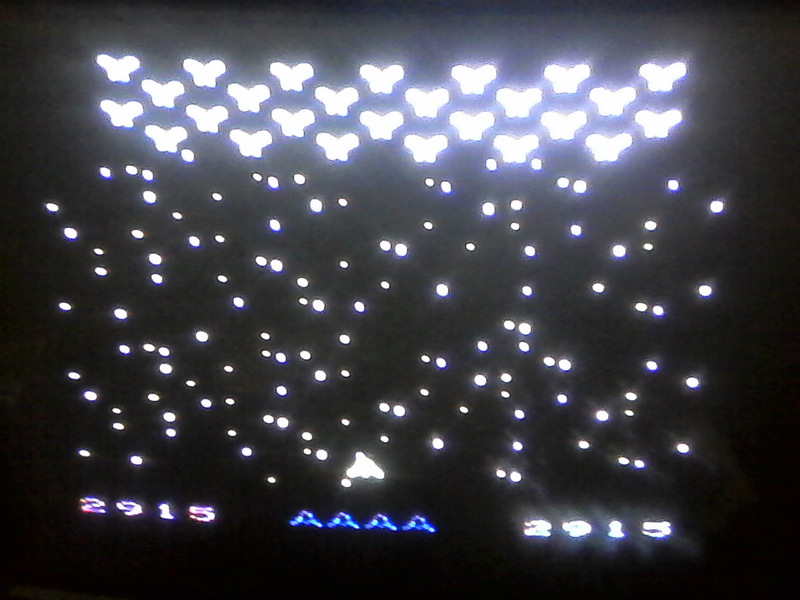 The highest score will displace on the bottom right corner so next player can challenge. Do not depress "reset" button, otherwise all scores will be wiped out. This game has a freezing ability so that you may FREEZE the game whenever it is necessary until you come back to continue to play it again. Use right hand controller for freezing or unfreezing action. To FREEZE the game, press any FREEZE key on keyboard and all action will be freezed including the sound. Decrease the volume level of your TV if necessary. For UNFREEZE function, press any UNFREEZE key on keyboard and action will be resumed immediately. If volume has been decreased while freezing, be sure to increase the volume of TV back to desired level before unfreezing the game. 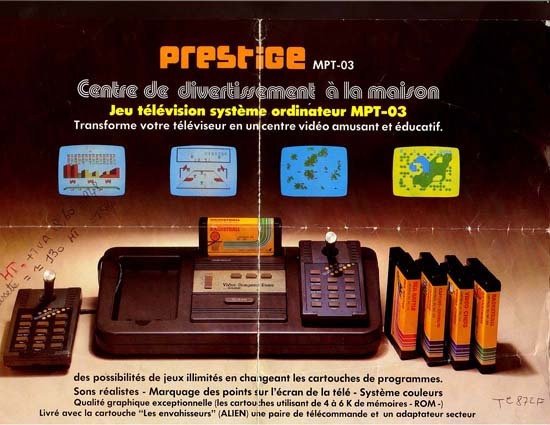 The Prestige Video Computer Game MPT-03 console, released in France, had a release of Space Vultures called Vautour de l'espace. 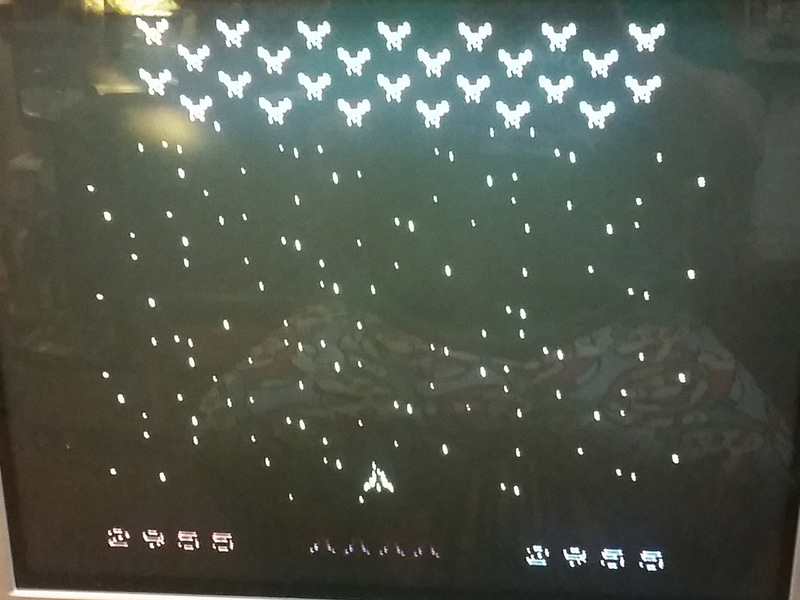 Prestige published a game catalog that has a picture of the missing mothership level from that game. 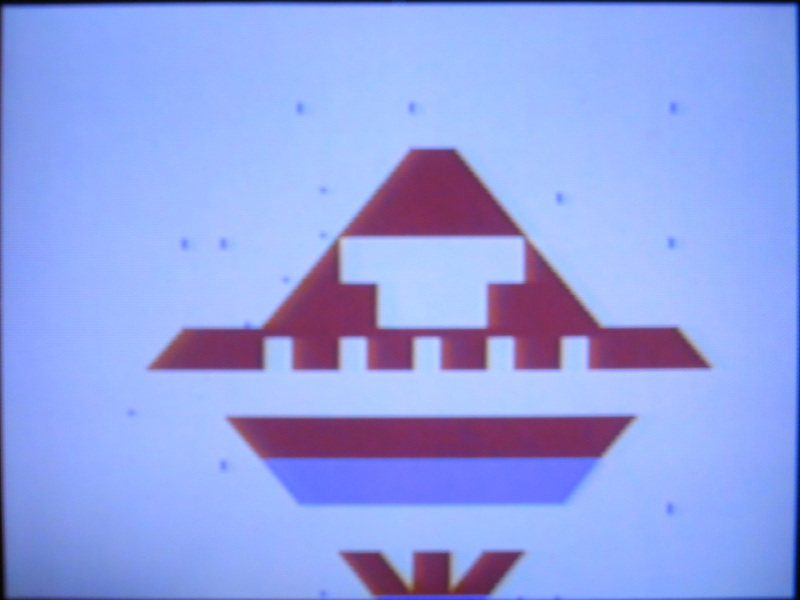 I used this tiny picture as a basis for my mothership "level" (a still image, really) that I released to the Arcadia Yahoo group on June 9, 2002. This "stage" is on most Arcadia multicarts. Check out the bonus points area below for various ways to earn bonus points with this mothership level. 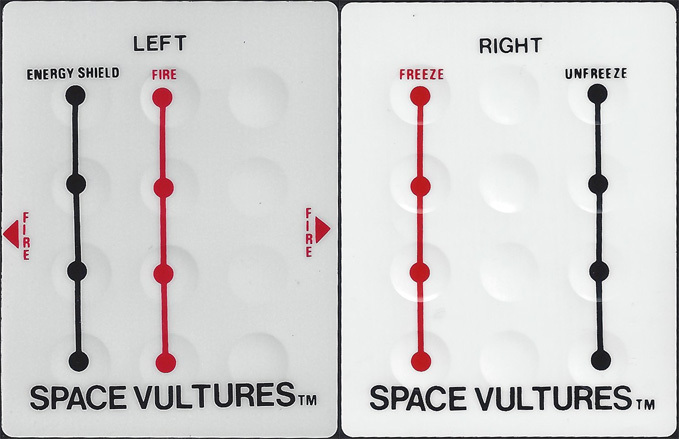 Space Vultures has a few gameplay options, but we're just playing the game on the default setting: just press start once to play (if you press it twice in a row then you'll start on the second stage; don't do that). We are playing for the highest score. 10 points are awarded for first place, 9 for second, 8 for third, etc. Space Vultures - Video Game Play - (1 Point) - I didn't find any proper gameplay video this game being played on real hardware (I'm pretty sure that all the videos of this game that I did find were made using emulation). Anyone who makes a video of a complete game being played on real hardware will earn one point. Please make sure to show that there is an energy shield available (press buttons 1, 4 or 7 on the left controller). Space Vultures - Video Review - (2 Points) - I didn't find any reviews of this game. I'd really like to see some quality video that talks about the gameplay. Anyone who reviews Space Vultures will earn two points. Note that a video review has the extra point built-in that would otherwise be awarded for a gameplay video. Space Vultures - Documenting Bugs - (1 Point) - As we've been discovering for ourselves, Arcadia games can be flaky. If anyone finds any problems, and documents them, then they will earn one bonus point. Just in case there are dozens of bugs, you can only earn one bonus point no matter how matter bugs are found. Space Vultures - Backstory - (1 Point) - Space Vultures doesn't provide a backstory. I guess one isn't needed for this game, but it might be fun to write one anyway. Write a background that may have been included with the game in 1982 and you'll get a bonus point. Space Vultures - "Play" Mothership Level - (1 Point) - Anyone who tries out my mothership level on real hardware or under emulation (and provides a screenshot) gets a bonus point. This is dead simple; everyone should get this point. Space Vultures - Play and Integrate Mothership Level (10 Points!!!) - Special Note: This programming challenge is open for all of season 2 (which is all of 2018!!!). Somewhere out in the world there may be a prototype of Space Vultures that has the mothership level built into it. 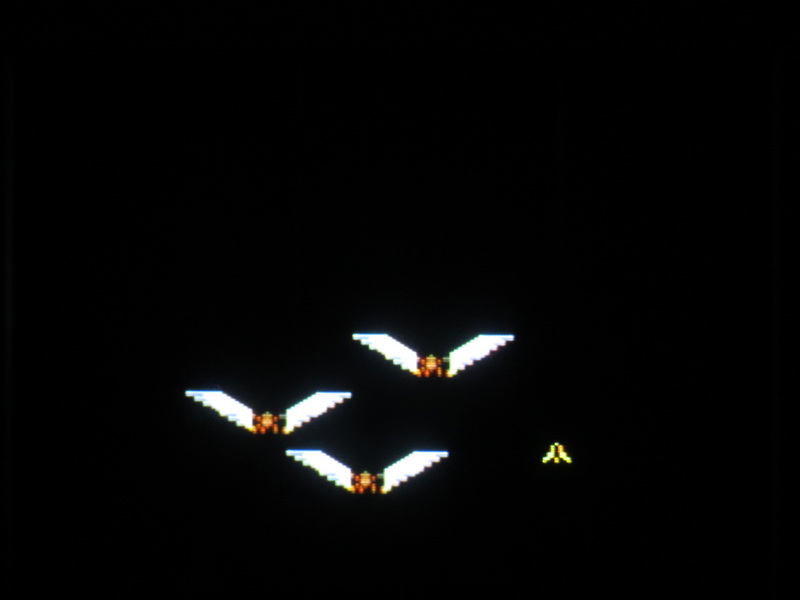 Anyone who builds the mothership level into Space Vultures in a gameplay style like the arcade game Phoenix, and makes this missing third level fully playable in no more than 8KB, will get ten bonus points. Hell, maybe even more bonus points-- this might be negotiable, as this isn't a trivial task! This isn't a simple undertaking, but it might be fun to do for those very few people with the proper skill set! I first played Space Vultures in about 2002. I didn't find it to be a great game, but it isn't bad either. It's simple and it works. I also don't recall any bugs, but it's been a long time since I've played this game for anything more than a few passing moments. Fifteen years ago I was hooked on Space Vultures for a little while. That's why I devoted some time to creating the static mothership screen. I wish that I had the programming chops to get this missing level into the game. I think if you give this game a chance that you'll have fun with it. So, give it a go; what can you lose? This season is just starting, so jump right in from the beginning of round 1 and have some fun beating the feathers out of these space birds! After the first screen of attacking vultures is passed, and then there are the three larger (mother) hawks, do you ever go back to the first screen, or does the mother hawk screen just loop forever...? I could easy beat that score, but it's not worth the trouble. Once you get to the second screen, this game is incredibly boring because the "mother hawks" screen just repeats over and over. Also, the collision detection in this game is awful. At least it affects both the you and the baddies. They shoot through you and you shoot through them. That great or terrible, depending on who it affects. I was playing Space Vultures with my friend last night and he thinks (and I agree) that once you reach the second screen you could probably play this game forever and get incredibly high scores. There are only a few things that make continuing forever more difficult: the already mentioned collision detection issues, hand cramping from firing over and over and complete apathy toward the game. I never used the shield, as it's awkward to press a button required to use it. 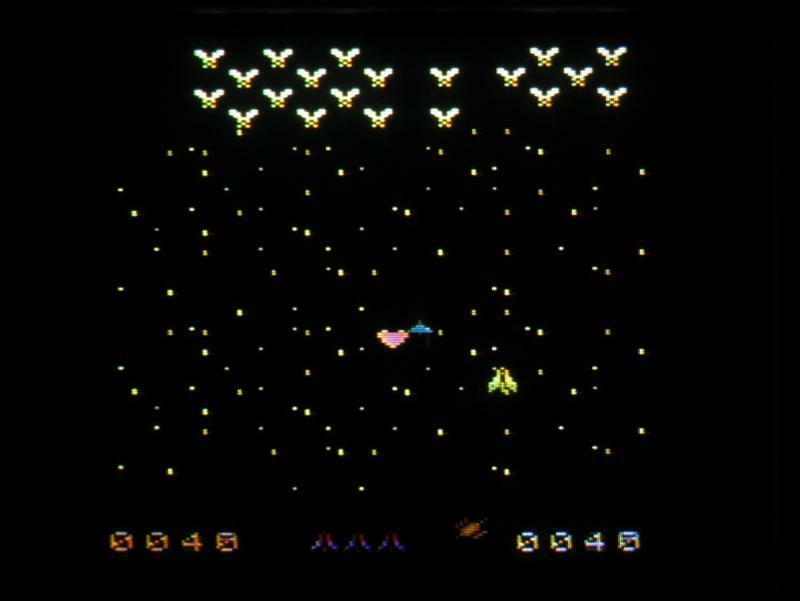 Last night my friend mentioned that the "rocket's" ability to move up and down on the first level reminded him of Centipede or Gorf. He's right: UA Ltd. didn't mind borrowing ideas from everybody else. It's just too bad that they couldn't manage to put their own spin on those copied ideas. Space Vultures is a 6KB game. Many games for the Arcadia are 2KB or 4KB. What was that extra ROM storage used for? Graphics? It's really a shame that the mothership stage is missing from this game, as it would have given the game a little more variety-- and it truly needs it. This is a perfect round for someone to join, because if you're willing to put in the time, then anyone probably could grab first place! For me, Space Vultures is the worst game we've played so far in the Arcadia HSC. As I've mentioned before, you can't read the Yahoo group messages unless you're a member. It will go back to the first screen, but with only 0-6 enemies. You only get a screen with the full 26 enemies once, at the start of the game. I agree it is an incredibly tedious and generally awful game; the worst Arcadia game by a considerable margin, in my opinion. This corruption lasts until the next game. Space Vultures is a 6KB game. 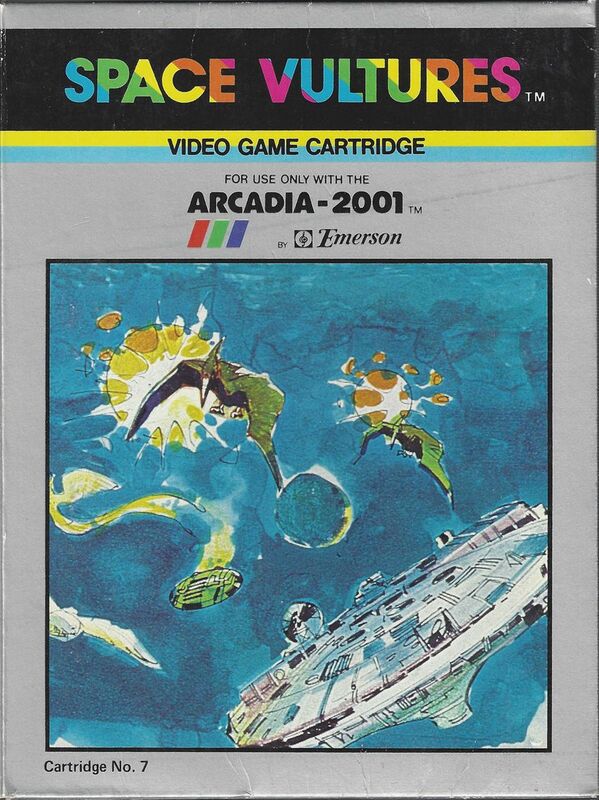 Many games for the Arcadia are 2KB or 4KB. What was that extra ROM storage used for? It's very poorly coded, eg. lots of absolute jumps when relative ones could be used instead. Season 2, Round 1 of the Arcadia 2001/MPT-03 High Score Club ended on Sunday, January 21, 2017 at 10pm MST. Four people played Space Vultures in this round. Special Note: Integrating the "mothership" level into Space Vultures is open all season (so, for all of 2018). This round's overall winner is Darrin9999. Please check your final score. I considered writing a backstory for Space Vultures… but I couldn't see putting any additional time into this game. Put plainly, Space Vultures is awful. Terrible. Horrible. I'd look up more synonyms for these kinds of trash-talk words, but it isn't worth the effort or time. What's the best thing that can be said about Space Vultures? It's extremely repetitive. That in itself is not a bad gameplay element-- heck, most classic games are repetitive in some way-- but Space Vultures takes its repetitive gameplay to a whole other level with its crazy idea of shooting just three "mother hawks" over and over and over again. Why not, at least, bring us back to the first level? I'm rather sure that anyone, without much practice at all, could play this game forever. Nobody did that during this round. Why? Because no one playing Space Vultures hates themselves quite that much. I think that Mark Canon summed up this game best when he said, "Can't take anymore." James Jacobs also didn't hold any punches when he said, "[Space Vultures is] the worst Arcadia game by a considerable margin." Could the missing mothership level have made this game better? Nope. Edited by Cdstahlman, Wed Mar 7, 2018 7:47 PM. Is it just me, or does your player character look like the Atari logo?